Cover to K-On! manga volume 1 featuring Yui Hirasawa. K-On! (けいおん!, Keion!) is a Japanese four-panel comic strip seinen manga written and illustrated by Kakifly. The manga was serialized in Houbunsha's manga magazine Manga Time Kirara between the May 2007 and October 2010 issues. It was also serialized in Houbunsha's magazine Manga Time Kirara Carat. The manga relaunched from April 2011 to June 2012 with two separate storylines published in Manga Time Kirara and Manga Time Kirara Carat. The manga is licensed in North America by Yen Press. A follow-up manga, K-On! Shuffle, began serialization in July 2018. A 13-episode anime adaptation produced by Kyoto Animation aired in Japan between April and June 2009. An additional original video animation (OVA) episode was released in January 2010. A 26-episode second season, titled K-On!! (with two exclamation marks), aired in Japan between April and September 2010, with an OVA episode released in March 2011. An animated film based on the series was released in Japan on December 3, 2011. Bandai Entertainment had licensed the first season until their closure in 2012. Sentai Filmworks has since re-licensed the first season, in addition to acquiring the rights to the second season and film. The title of the series comes from the Japanese word keiongaku (軽音楽), which means popular music. K-On! has achieved strong sales in Japan, and by 2011 gross revenues had reached over ¥15 billion. In an unspecified part of Japan, four high school girls join the light music club of the all-girls private Sakuragaoka High School to try to save it from being disbanded. However, they are the only members of the club. At first, Yui Hirasawa has no experience playing musical instruments or reading sheet music, but she eventually becomes an excellent guitar player. From then on, Yui, along with bassist Mio Akiyama, drummer Ritsu Tainaka, and keyboardist Tsumugi Kotobuki spend their school days practicing, performing, and hanging out together. The club is overseen by music teacher Sawako Yamanaka who eventually becomes their homeroom teacher as well during their final year of high school. In their second year, the club welcomes another guitarist, underclassman Azusa Nakano. After Azusa joins they gain more structure and begin to practice more. After their third year, Yui, Mio, Ritsu and Tsumugi graduate and enroll into a university. There they join its light music club alongside three other students: Akira Wada, Ayame Yoshida, and Sachi Hayashi. Meanwhile, Azusa continues to run the high school light music club alongside Yui's sister Ui, their classmate Jun Suzuki, and new members Sumire Saitō and Nao Okuda. The spin-off manga K-On! Shuffle focuses on a new set of characters at a different school. After being inspired by the Sakuragaoka High School light music club, Yukari Sakuma and friend Kaede Shimizu seek to form their own club. Along with classmate Maho Sawabe, they discover the Light Music Appreciation Society, a club run by Riko Satou. Yui is the lead guitarist and split vocalist of the Light Music Club who plays a Heritage Cherry Sunburst Gibson Les Paul Standard electric guitar (before she knew how to play the electric guitar, the only instrument she knew how to play was the castanets) that she nicknames "Gīta" (ギー太). She does not get good grades in school (though when properly coached, she can achieve astounding results) and is easily distracted by trivialities (mainly those deemed cute and adorable). Yui is clumsy and easily spaces out most of the time; as a result, she can be forgetful and is sometimes oblivious to the situation around her. Yui has shoulder-length, brown hair (a little longer than Ritsu's) which she accessorizes with two yellow hair clips, and brown eyes. She takes a huge liking for any kind of food (though she never gains weight, which is greatly envied by Mugi, Mio, and Sawako). She has a younger sister named Ui, who is very mature and acts as the "older sister" of Yui, taking care of her and keeping her in line. Yui works extremely hard to get better at playing guitar. During performances, Yui plays with amazing energy and joy which usually results in great response from the audience. As a musician, Yui has absolute pitch—she can tune her guitar perfectly without a tuner, which greatly impresses Azusa, who has played the guitar much longer than Yui. She has a very easy-going nature, but has incredible focus and retention when she has a clear goal in sight; unfortunately, this is limited to only one subject at a time, and her other skills deteriorate quickly (for example, Yui is at one point pressed to make up failing test scores, and she quickly brings her math skills up to par at the expense of her guitar knowledge). Despite all of this, Yui is still devoted to her band and will always practice hard enough for the club. At school, she has become quite admired for her great voice. However, she is known to forget her lyrics mid-performance as well as overdoing things, making her unable to perform sometimes. Mio was the lead vocalist at first, since Yui could not play the guitar and sing at the same time. Yui is also known to write childish lyrics as Ui has assisted her in creating them. Mio is the bassist, songwriter, and split vocalist for the light music club. She is a shy girl who is in the light music club. She plays a left-handed, 3-Color Sunburst Fender Jazz Bass with a tortoiseshell pickguard, though is shown playing a Fender Precision Bass in the first manga volume. She uses D'Addario EXL160M medium bass strings. Her bass is given the name Elizabeth (エリザベス, Erizabesu, or Elizabass) later in the anime. While she originally intended to join the literary club, she was forced into the light music club by her childhood friend and the club's president/drummer, Ritsu. She gets excellent grades in school and is often mature and strict especially where Ritsu is involved; her weakness is the horrific; she is often incapacitated with fear when stories involving ghosts, blood, injuries, haunted houses, barnacles or other disturbing topics come up. She also has a fear of being in the spotlight and gets embarrassed easily, and is often subject to teasing from Ritsu and Sawako, their club adviser and eventual third-year homeroom teacher. Mio has long, straight black hair and gray eyes (that are angled slightly more than the other characters). She cites that she chose bass since it is not the center of attention in the band, unlike the guitarist. Mio is more technical when it comes to music, and Yui often comes to her when she is in need of more guitar tutorials. Mio is the split vocalist of the band, though given her dislike of being center stage, she tries to avoid taking the lead vocal if possible, generally singing if Yui is unable to. She writes most of the songs, although they usually feature some odd and overly girlish lyrics like "Light and Fluffy Time". As she is left-handed, she becomes entranced whenever she sees left-handed instruments because of their rarity. After their first live performance, the attractive Mio gained a huge fan following (in no small part due to an unfortunate accident that occurred at the end of the show), led by an infatuated former student council president. Also resulting from her sudden popularity, most of her classmates voted that she portray Romeo in their class play. Mio comes to greatly enjoy her time at university as she encounters many new experiences. She is also able to overcome some of her shyness and make new friends such as Sachi and Ayame. Ritsu (or Ricchan (りっちゃん, Ritchan), as nicknamed by Yui) is the self-proclaimed president of the light music club and the leader of Hokago Tea Time who plays a yellow Rick Marotta Signature Yamaha Hipgig drum kit (with an add-on floor tom in the opening credits only) combined with a cymbal set from Avedis Zildjian, though is shown playing a white Yamaha Absolute Series drumkit in the anime's closing credits. She has an ambiguous yet upbeat personality, much like Yui, but often has trouble remembering important club activities and announcements and gets constantly rebuked by Mio and Nodoka for forgetting to send in important forms concerning the club. Ritsu is cheerful, often likes making jokes and is sarcastic most of the time. She is skilled at brainstorming ideas that earn money for the club. Ritsu has shoulder-length, brown hair, with her bangs pulled back with a yellow hairband, and gold-colored eyes. She wears her school jacket open. She says she chose to play the drums because they are "cool", but later admits that she has trouble playing instruments which involve intricate finger movements such as the bass, guitar and keyboard. She is Mio's childhood friend and will often take the opportunity to tease her whenever Mio is cowering from something. She is also known to become easily jealous of Mio's other high school friends, even going as far as spying on Mio when on outings with them. Ritsu is always on the go and will stop at nothing for the success of the light music club. Despite her rough mannerisms and speech, she gets cast as Juliet by the majority of her classmates in their class play rendition of Romeo and Juliet and, in the end, manages to act like a proper girl. In the anime, she states her favorite drummer is Keith Moon of The Who. She is skilled at cooking. She has a younger brother named Satoshi (聡, Voiced by: Mika Itō (Japanese); Amanda C. Miller (English)). Tsumugi, often referred to as Mugi (ムギ) by her friends, is a wealthy Kansai girl with a gentle and sweet personality who plays a Korg Triton Extreme 76-key keyboard, though she is also seen playing a Korg RK-100 keytar in the closing credits of the first season, and a Hammond organ in the closing credits of the second season. She originally intended to join the choir club, but joins the light music club instead after receiving an invitation and encouragement from both Mio and Ritsu. Tsumugi is considered a piano prodigy since she has been playing the piano since she was four and has experience in winning various piano contests. Tsumugi has written several songs for the light music club, as well as singing the back vocals in several other songs. She is a good student and has long, pale blonde hair, blue eyes, unusually large eyebrows that apparently run in her family, and a fair complexion that the other characters do not have, but she does not get sunburned. She however, has great difficulty playing electric guitar. She is the daughter of a company president, and her family has several villas in various places around Japan (and even one in Finland). Since her father also owns a maid café, she often brings confectionery and an assortment of sweets and pastries to the club room, and she diligently makes tea with a tea set which is kept in their club room. Despite her wealth, she is fascinated by and finds joy in "normal" activities, such as ordering fast food, sharing french fries with her club mates, holding down part-time jobs and haggling over prices. Tsumugi displays a rebellious streak occasionally, diverting from her normally well-behaved and mature demeanor to the surprise of the others. She also displays a childlike eagerness from time to time, and possesses unusually high strength, being able to effortlessly carry around her own keyboard, Ritsu's drums, amplifiers, and at one point beating an arm-wrestling game in an arcade. Tsumugi is often entranced by the sight of two girls interacting closely together, sometimes imagining something more risqué in her head. While a lot of things do not bother her, she is fairly conscious about her weight (just like Mio), and she gets a bit anxious when her family's staff start spoiling her friends during villa visits. She later begins learning how to play the guitar from Azusa. Tsumugi has a childhood friend several years younger than her named Sumire Saitō, who is a daughter of the family that serves the Kotobuki household. Tsumugi grew up home schooled, and therefore spent very little time in the outside world. Because of their close friendship, Sumire would purchase everyday items for Tsumugi, like manga that she was not normally allowed to see. Tsumugi was rather taken by some of the yuri manga she received, which may have influenced her later perceptions about relationships. When Sumire started high school, Tsumugi wanted her to experience the light music club on her own, but due to Sumire's shyness Tsumugi came up with the excuse of sending her to the club room to pick up the tea sets that had been left there and told Sawako when Sumire did join that it was okay to leave the tea sets there. Azusa is a student in the same year and class as Yui's sister Ui, who joins the light music club and becomes the rhythm guitarist, playing a Fender Mustang electric guitar. She eventually names her guitar Muttan, as it is a Mustang. She is a self-proclaimed "novice" guitarist who has been playing the guitar since she was in the fourth grade, and her parents are working in a jazz band. She is more serious than the other girls, and does not like to admit how she really feels. She often finds herself bewildered by the tea parties and cosplaying aspects of the club, when she would rather just practice, and is curious about how the club is able to play so well despite their problems and lack of practice. However, she has a certain weakness for cakes and can be calmed down rather easily, sometimes by just being petted. She is constantly a victim of Yui's physical affection and is nicknamed Azu-nyan (あずにゃん) after trying on a pair of cat ears and meowing ("nyan" being the equivalent of "meow" in the Japanese vocabulary). Despite this, Azusa is not too good with cats. Azusa has long black hair, which she wears in pigtails, and brown eyes. While Azusa is talented in guitar, she has trouble singing while playing unlike Yui and Mio. In the band, she looks up to Mio the most due to her maturity and the fact that she is an experienced bassist, even trying to give Mio chocolate on Valentine's Day. However, she sometimes unintentionally makes remarks concerning Mio's weaknesses, such as her weight. She also finds Mugi very beautiful, and envies her hair and large eyes, and later starts teaching her how to play guitar when the two are alone in the club room. Since joining, Yui comes to her for advice on playing guitar, as well as maintenance. She gets a tan extremely easily, once during their time at the beach and another during a music festival (even after applying sunscreen). As a result, she frequently gets sunburned as well. She gets lonely very easily, and often worries that everyone in the club will leave her, as they are one year older and eventually will graduate. Due to this, the rest of the girls buy her a turtle to look after, naming it Ton. Outside of the band, she often hangs out with Ui and Jun whenever the other girls are busy. When the others graduate, she becomes the new light music club president alongside Ui and Jun, who decide to join her. Together with two new members, Sumire and Nao, they form a new band called "Wakaba Girls" (若葉ガールズ, Wakaba Gāruzu, lit. Fresh Leaf Girls). During the Wakaba Girls' first summer training camp Azusa reveals to Sawako her belief that she is unable to act like a proper president for the light music club; however, Sawako suggests that there is no proper way to define what it means to be a president and that Azusa will do just fine. While on that same training camp Azusa is convinced by the others to become the band's vocalist despite her prior reservations on the issue. Sawako is a music teacher who is the adviser for the wind instrument club at the girls' school. An alumna of the school and a member of the light music club in her student days, she does not want people to find out that she was formerly a member of a heavy metal band called Death Devil (of which she was both lead guitar and vocalist and went by the stage name of Catherine (キャサリン, Kyasarin)), thus she covers up by being mild and gentle to her coworkers and especially to students. She is forced to be the adviser of the light music club, as Ritsu blackmails her after the girls learn of her past. However, she is able to juggle being the adviser for the wind instrument club as well, even as the story progresses. Though she has a mature and gentle demeanor in the school, Sawako (affectionately addressed as Sawa-chan (さわちゃん, Sawa-chan) by both Ritsu and Yui) displays a totally different, completely authentic character when she is alone with the light music club. In reality, she is rather wild, lazy, and is quite an irresponsible teacher who enjoys dressing up the light music club in (sometimes embarrassing) cosplay costumes (like French maid uniforms), much to the dismay of Mio. She gets a thrill out of the rare moments where she is praised for her work. She names the club band "Ho-kago Tea Time" after the members take too long deciding on a name themselves. In the anime, she once pitches in for Yui with her white Epiphone "1958" Korina Flying V electric guitar. She becomes the girls' homeroom teacher in their third year, and puts Nodoka and all the band members (except Azusa, since she is a grade lower) in the same class, so she does not have to remember as many names. An episode in the second anime season reveals that she owned one of the first Gibson SG models (from around 1960 with a custom stoptail bridge) which is later sold. Due to her relation to the club members, the other students in her class start to call her Sawa-chan as well, ruining her image as a mild-mannered teacher. Her image is further ruined after Death Devil is temporarily reunited at a wedding reception for a high school alumnus. Regardless, her popularity with the students remains unchanged. In spite of her laziness, she still proves herself to be an able mentor, as shown by her willingness to coach Yui as the lead singer and attending their performances. Her music abilities apparently have not dulled over the years, as she is able to substitute for Yui at the school festival at almost no notice without the assistance of a music score, even without any prior practicing of the band's song. Sawako is also very perceptive: she immediately sees through Ui's disguise when she impersonates her sister and on several occasions boasts to the club that there is nothing she cannot see. Ui is Yui's younger sister, who begins the story as a third-year junior high school student, but later enters Yui's high school the following year in the same class as Azusa. Unlike her older sister, Ui is mature, responsible, and handles household chores well. Despite these differences Ui shares a very strong relationship with Yui and has a great deal of love and admiration for her older sister that sometimes borders on a sister complex. She takes particularly good care of Yui and strives to look after her even at risk to her own health. Ui is considered to be the ultimate groupie for her sister's band and supports them with all her heart. She occasionally provides a narrative to the story. Despite being a year younger than Yui, she is nearly identical to her older sister with her hair down and is even able to fool members of the light music club on more than one occasion. However, Sawako Yamanaka can tell Yui and Ui apart easily, saying 'their bust sizes are completely different'. Ui is a fast learner, able to learn how to play the guitar after only a few days' practice. She is also able to play the organ if needed. She eventually joins the light music club along with Jun at the end of the series, becoming a guitarist like her sister, playing a Surf Green Fender Stratocaster electric guitar. Ui becomes fascinated with Sumire's sister-like relationship with Tsumugi upon learning of it, as Ui sees it as very similar to her feelings toward Yui. Nodoka is Yui's childhood friend and confidant who is a member of the school's student council. As a normal, well-mannered and intelligent girl, she is generally taken aback by the light music club's odd behavior, and easily gets annoyed with Ritsu whenever she forgets to fill in the club's application forms. She shares the same class as Mio in their second year, who appreciates her companionship tremendously, she being the only person Mio knows in her class. In her third year, she replaces Megumi Sokabe as the student council president and the Mio fan club president as well (after a while), the latter at Megumi's request. In her third year, she shares a class with the rest of Hokago Tea Time. Nodoka chooses to go to a national university as opposed to the same college as Yui and the others. Jun is an outgoing girl and a friend and classmate of both Azusa and Ui from before they joined the light music club. Ui at first tried to get Jun to join the light music club but ultimately failed due to a strange visit to the club room. Thanks to this experience, Jun stayed in the Jazz club instead. While there she played a Yamaha Sbv500 bass. Jun became one of Mio's admirers because they both play bass. Jun begins to regret not joining the light music club when she hears about all the activities they do and eventually joins the light music club at the end of the series. She attempted to play the guitar but she did not feel that it suited her. She has an older brother named Atsushi who also plays bass and regularly gives Jun lessons. Jun was embarrassed when the light music club found out that she was receiving these lessons because she felt it damaged her image as a person who could learn an instrument on their own. Jun owns a pet cat in the anime series. Sumire is a shy blonde girl who meets Azusa, Ui and Jun after Yui and the others graduate. She is a freshman, two years below the other light music club members. She is currently working in the Kotobuki household as a maid and originally came to the light music room to try to retrieve Tsumugi's teaset that was left behind after she graduated. After being scared off a few times by Sawako, she eventually agrees to join the light music club and eventually becomes its drummer. Similar to Tsumugi, she is quite talented at preparing tea, but feels inclined to keep her role as a maid a secret from the others due to the fear of being punished by Tsumugi. As her family, who came from Austria (Australia in the manga), were taken in by the Kotobuki household before she was born, Sumire grew up as Tsumugi's playmate, often regarding her as her older sister and inadvertently sparking Tsumugi's interest in yuri by introducing her to manga of that genre. As she grew up and learned the truth about the relation between the two families, Sumire felt she needed to regard Tsumugi with more respect while in public. Sawako reveals that Tsumugi asked that the tea sets be left in the club room. However, before the beginning of the new term Tsumugi had asked Sumire to remove the tea sets thereby ensuring that Sumire would encounter the other members of the light music club and would be invited to join. Sumire's situation is revealed to the surprise of the other members of the club by Sawako. Sumire uses her close ties with the Kotobuki family to reserve the use of their largest seaside villa for her first summer training camp with the light music club. Another freshman in the same class as Sumire. Generally poor at physical activities, Nao goes through several trial runs through various clubs before deciding to join the light music club, as she feels it is where she can try her best. Like the kanji in her name, she is overly honest about her shortcomings. After reading up on music theory, she ends up having an advanced knowledge of music but lacks the ability to physically play it. However, when she is introduced to music creation software, she decides to become the band's producer. She is the oldest among the five siblings in her family. When on her first training camp with the Wakaba Girls, Nao writes the lyrics for the band's first song, titled "Answer". She wrote the song to reflect Azusa's misgivings about her role as president of the light music club. Okuda remarks that she keeps track of all her band mate's conversations and behaviors by entering her observations into her computer, therefore she was able to describe Azusa's exact feelings in her lyrics. A new character introduced in the restarted manga who is in a band called OnNaGumi (恩那組, On Na-gumi, "Gang of Girls") with her friends Ayame and Sachi. Akira joins the university's light music club alongside Yui and her friends. She has short black hair and often looks intimidating whenever her hair is messy. She studies in the Education department along with Yui. She is easily irritated to a degree but finds herself in a similar position to Azusa from high school as Yui seems to enjoy hugging her. She originally had longer hair in high school, but when a boy she admired accused her band of only being popular because of their cuteness, she decided to cut off her hair and vowed to become popular through talent. She plays an ebony Gibson Les Paul Custom electric guitar which she nicknames "Rosalie". One of Akira's friends, who has long hair. She is OnNaGumi's bassist and is in the same department as Mio. She is taller than Mio, and easily becomes embarrassed about her height if anyone mentions it. Another one of Akira's friends, who has short blonde hair. She is OnNaGumi's drummer and is in the same department as Ritsu. Due to their similarities, Ayame and Ritsu become friends very quickly. Ayame tends to follow the latest fashion trends, and has done so since high school. The president of J. Women's University's light music club who has a sweet appearance, but is generally obsessed over things such as money and looking youthful and can put out a threatening aura when she gets passionate about either one. She was once in a popular band with Hirose though retired upon entering university since wearing school uniforms would be considered silly at their age. However, Kana is still obsessed with school uniforms. An upperclassman in the light music club who was once in a band with Kana. Megumi is the former student council president and founder of the Mio Fan Club (with Nodoka becoming her successor in both positions). She stalks Mio during her last few days in high school because she wanted to see Mio one more time. The band offers her a song as a graduation gift. Megumi becomes a good friend of Ritsu through unspecified circumstances much to Mio’s surprise. She also helps Ritsu and Yui with the university entrance exams by giving them her old exam workbooks. She goes to the same woman's university in which Yui and her friends later enroll and lives in the same dorm as them. The protagonist of K-On! Shuffle, Yukari is a first-year student and aspiring drummer who decides to get involved in a music club after watching the light music club at Sakuragaoka High School. She elects to play the drums as she enjoys the loud noises. Yukari has a sister Kurumi, who attends a different school. Yukari's childhood friend. She decides to play the bass after seeing Mio's wardrobe malfunction at the Sakuragaoka High School's light music club performance. Yukari and Kaede's classmate who sits between them and is part of the Basketball Club. Against her will, she is dragged into the Light Music Appreciation Society; despite being a member of another club, Yukari points out school rules allow for students to be in both a club and an appreciation society. She is the appreciation society's guitarist. A second-year, Riko is the lone member of the Light Music Appreciation Society after the previous members had graduated or left. Although she claims to have never played an instrument, she is proficient in playing technique and music theory. K-On! began as a four-panel comic-strip manga written and illustrated by Kakifly. The manga was originally serialized in Houbunsha's Manga Time Kirara manga magazine between the May 2007 and October 2010 issues, ending on September 9, 2010. The manga also appeared as a guest bimonthly serialization in Manga Time Kirara's sister magazine Manga Time Kirara Carat starting with the October 2008 issue. The manga relaunched from April 2011 to June 2012 in two separate magazines. Chapters published in Manga Times Kirara, from the May 2011 issue released on April 8, 2011 to the July 2012 issue released on June 9, 2012, focus on the main cast as they attend college. Chapters published in Manga Time Kirara Carat, from the June 2011 issue released on April 28, 2011 to the August 2012 issue released on June 28, 2012, focus on Azusa, Ui, and Jun as they continue the light music club. Four tankōbon volumes were released between April 26, 2008 and September 27, 2010. The manga was licensed by Yen Press for English release, with the first volume released in North America on November 30, 2010. The college arc of the second manga run, titled K-On! College (けいおん! college), was released on September 27, 2012, and the high school arc, titled K-On! Highschool (けいおん! highschool), was released on October 27, 2012. Yen Press have also licensed these volumes in North America. In Indonesia, the series is licensed by Elex Media Komputindo. An anthology entitled Minna de Untan! (みんなでうん☆たん, Everybody's Untan! ), which features several guest strips from various artists, was released in September 2009. An official anthology series, K-On! Anthology Comic (けいおん!アンソロジーコミック, Keion! Ansorojī Komikku), began sale from November 27, 2009, with five volumes released as of October 12, 2011, and two "Story Anthology Comics" were released on November 26, 2011. An illustration book with official art and fan art from well known dōjin artists was released on January 27, 2010. A follow-up manga by Kakifly, titled K-On! Shuffle, began serialization in Manga Time Kirara on July 9, 2018. A 13-episode anime adaptation directed by Naoko Yamada, written by Reiko Yoshida, and produced by Kyoto Animation aired between April 3 and June 26, 2009 on TBS in Japan. The episodes began airing on subsequent networks at later dates which include BS-TBS, MBS, and CBC. The TBS airings are in 4:3 ratio, and the series began airing in widescreen on BS-TBS on April 25, 2009. Seven BD/DVD compilation volumes were released by Pony Canyon between July 29, 2009 and January 20, 2010. An additional original video animation (OVA) episode was released with the final BD/DVD volumes on January 20, 2010. The BD/DVD volumes contained extra short anime titled Ura-On!. The series later began airing on Japan's Disney Channel from April 2011. Animax has aired the anime in Hong Kong, Thailand, and Taiwan. Both an English-subtitled and English-dubbed version by Red Angel Media began airing on March 16, 2010 on Animax Asia. At their industry panel at Anime Expo 2010, anime distributor Bandai Entertainment announced that they have acquired K-On! for a DVD and Blu-ray Disc release, with Bang Zoom! Entertainment producing an English dub for the show. The series was released over four volumes in standard and limited editions for each format starting on April 26, 2011. Bandai released the full first season on DVD under their "Anime Legends" line on February 7, 2012. Manga Entertainment released the series in the UK in individual DVD volumes during 2011, and in a complete DVD of the first season on April 30, 2012. A planned BD box set release in 2012 was cancelled. Sentai Filmworks has licensed the first season and re-released the series on DVD on September 23, 2014. Sentai also re-released the series on Blu-ray on September 1, 2015. It was displayed on screen at the Let's Go live concert in Yokohama, Japan on December 30, 2009 that a second season would be produced. The second season, titled K-On!! (with two exclamation marks), aired with 26 episodes on TBS in Japan between April 7 and September 28, 2010. An additional OVA episode was released with the final BD/DVD volumes on March 16, 2011. As with the first season, the BD/DVD volumes contained extra short anime titled Ura-On!!. This season has also aired on Animax Asia starting October 20, 2010. Sentai Filmworks licensed the second season and released the series on DVD and Blu-ray in two boxsets released on June 19, 2012 and August 28, 2012 respectively. The series continues using the English dub cast from the previous season. A film adaptation of K-On! was released in Japan on December 3, 2011. It follows the girls as they travel to London to celebrate their graduation. Developed as an original story, it was produced by Kyoto Animation with Naoko Yamada as the director. The film features the two songs "Ichiban Ippai" and "Unmei wa Endless" by Aki Toyosaki. The ending theme is "Singing" by Yōko Hikasa. The film opened at #2 with a gross of ¥317,287,427 ($4,070,919 USD) from 137 theaters, and has earned a total of ¥1,639,685,078 ($21,419,792 USD) by the end of its run. The film features a London cafe inspired by the Troubadour Cafe in Earl's Court, and K-On! fans often visit the cafe. The film was released on BD and DVD on July 18, 2012. Sentai Filmworks released the film on BD/DVD in North America on May 21, 2013. Madman Entertainment released the film in Australia on BD/DVD. The first season anime's opening theme is "Cagayake! Girls" by Aki Toyosaki with Yōko Hikasa, Satomi Satō and Minako Kotobuki. The ending theme is "Don't Say 'Lazy'" by Hikasa with Toyosaki, Satō and Kotobuki. The opening and ending theme singles were released on April 22, 2009. A single containing the insert song "Fuwa Fuwa Time" (ふわふわ時間, Light and Fluffy Time) used in episode six was released on May 20, 2009. A series of character song singles have been released containing songs sung by the voice actresses of the five main characters. The singles for Yui (by Toyosaki) and Mio (by Hikasa) were released on June 17, 2009. The singles for Ritsu (by Satō) and Tsumugi (by Kotobuki) were delayed, but later released together with the single for Azusa (by Ayana Taketatsu) on August 26, 2009. The singles for Ui Hirasawa (by Madoka Yonezawa) and Nodoka Manabe (by Chika Fujitō) were released on October 21, 2009. The anime's original soundtrack, largely composed by Hajime Hyakkoku, was released on June 3, 2009. The four songs highlighted in episode eight of the anime were released on the mini album Ho-kago Tea Time (放課後ティータイム, After School Tea Time) on July 22, 2009. The single "Maddy Candy" by Sawako's band Death Devil (sung by Asami Sanada) was released on August 12, 2009. The second season anime's first opening theme is "Go! Go! Maniac" and the first ending theme is "Listen!! "; both songs are sung by Toyosaki, Hikasa, Satō, Kotobuki, and Taketatsu. The singles containing the songs were released on April 28, 2010. From episode 14 onwards, the respective opening and ending themes are "Utauyo!! Miracle" and "No, Thank You! ", both by Toyosaki, Hikasa, Satō, Kotobuki, and Taketatsu. The singles containing these songs were released on August 4, 2010. The single "Pure Pure Heart" also sung by Toyosaki, Hikasa, Satō, Kotobuki, and Taketatsu was released on June 2, 2010. Another single, "Love", by Sawako's band Death Devil (sung by Sanada) was released on June 23, 2010. A single sung by Toyosaki, "Gohan wa Okazu/U&I", was released on September 8, 2010. The composer Bice who wrote the song "Gohan wa Okazu" died on July 26, 2010 of a heart attack; the song was their final work. A second set of character song singles were released, starting with the singles for Yui (by Toyosaki) and Mio (by Hikasa) on September 21, 2010. The show's second album, Ho-kago Tea Time II, was released on both normal double CD and limited edition that came with a cassette tape on October 27, 2010. The second set of singles for Ritsu (by Satō), Tsumugi (by Kotobuki), and Azusa (by Taketatsu) were released on November 17, 2010. The set of singles for Jun (by Yoriko Nagata), Ui (by Yonezawa), and Nodoka (by Fujitō) were released on January 19, 2011. The singles and albums were released by Pony Canyon. The first set of character song singles will[when?] be released on vinyl at Canime Summer Festival. A rhythm video game titled K-On! Hōkago Live!! (けいおん! 放課後ライブ! !, Keion! Hōkago Raibu!! ), developed by Sega for the PlayStation Portable, was released on September 30, 2010. The gameplay involves the player matching button presses in time with music featured in the anime. The game supports local multiplayer for up to five PSPs. The game features 19 songs from the first anime season and first set of character song CDs. The player can customize the clothing, hair style and accessories of the characters, plus customization of the light music room and Yui's bedroom. There is also a custom track maker. A remastered HD port of the game was released for the PlayStation 3 on June 21, 2012. An arcade game developed by Atlus, K-On! Hōkago Rhythm Time (けいおん!放課後リズムタイム, Keion! Hōkago Rizumu Taimu), was released in Japanese arcades in spring 2013. The game features rhythm gameplay and also awards trading cards that can be used to read songs into the game. A second arcade game by Sega titled K-On! Hōkago Rhythm Selection (けいおん！放課後リズムセレクション, Keion! Hōkago Rizumu Serekushon) was released on November 13, 2014. 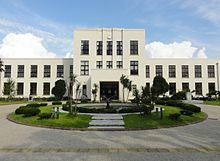 Fans of the anime visit the former elementary school in Toyosato, Shiga, which is used as a model for the high school in the anime. 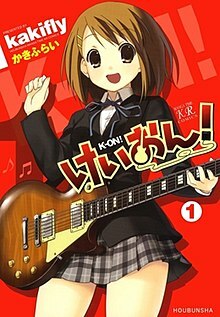 The first manga volume of K-On! was the 30th highest-selling manga volume in Japan for the week of April 27 and May 3, 2009, having sold over 26,500 volumes that week. The following week, the first and second manga volumes were the 19th and 20th highest-selling manga volumes in Japan, having sold 23,200 and 22,500 volumes each the week of May 4 and May 10, 2009. As of May 2009, the first two manga volumes each sold about 136,000 copies each. The third volume sold over 120,000 copies the week of December 14–20, 2009, and became the 46th top-selling manga in the first half of 2010 in Japan (ending May 23), selling over 328,000 copies. The single for the first anime's opening theme, "Cagayake! Girls", debuted at fourth in the ranking on the Oricon weekly singles chart, selling approximately 62,000 copies. The ending theme "Don't Say 'Lazy'" debuted at second in the ranking, selling 67,000 copies. It was also awarded Best Theme Song at the 2009 (14th) Animation Kobe Awards. Additionally, "Cagayake! Girls" and "Don't Say 'Lazy'" were certified Platinum by the Recording Industry Association of Japan (RIAJ) for 250,000 full-track ringtone digital music downloads (Chaku Uta Full), respectively. The mini album Ho-kago Tea Time debuted at No. 1 on the Oricon weekly CD albums charts selling 67,000 copies, making it the first image song album credited to fictional anime characters that reached the highest position. The second anime's opening theme "Go! Go! Maniac" and ending theme "Listen!!" debuted at No. 1 and No. 2 in their first week of release on the Oricon singles chart, selling over 83,000 and 76,000 copies, respectively. "Go! Go! Maniac" became the first anime image song to ever top the singles chart and the band also became the first female vocalists to occupy the top two spots on the singles chart in 26 years since Seiko Matsuda in 1983. The season's second ending and opening themes, "No, Thank You!" and "Utauyo! Miracle" respectively, sold 87,000 and 85,000 in their first week and ranked at No. 2 and No. 3 in the Oricon charts respectively, only being beaten by SMAP's single, "This is Love". "No, Thank You!" and "Utauyo! Miracle" were certified Gold by the RIAJ in August 2010 for 100,000 copies shipped. The single "Gohan wa Okazu"/"U&I" debuted at No. 3 on the Oricon singles chart, selling 53,000 in its first week. The album Ho-kago Tea Time II debuted at No. 1 on the Oricon weekly CD albums charts selling 127,000 copies. The first Japanese DVD volume of the anime series sold around 8,000 copies to debut seventh in the ranking on the Oricon charts for the week of July 29, 2009. The Blu-ray Disc release of the first volume sold about 33,000 copies in the same week, to top the Oricon BD charts. In August 2009, the first volume of K-On! was the top-selling anime television Blu-ray Disc in Japan, having surpassed the previous record holder Macross Frontier, which sold approximately 22,000 copies of its first volume. It was the second best-selling Blu-ray Disc in Japan, trailing only Evangelion: 1.0 You Are (Not) Alone, with around 49,000 copies. However, in October 2009, the first volume of Bakemonogatari surpassed K-On! 's previous record, having sold 37,000 copies at that time. Later, with the release of K-On!! volume 3, total BD sales for the series have outsold Bakemonogatari. K-On! received a Best TV Animation Award at the 2010 Tokyo International Anime Fair. K-On!! won the Best Television award at the 2010 (15th) Animation Kobe Awards. Both series have sold a combined total of over 520,000 BD copies as of February 20, 2011. The film was nominated for the 2012 Japan Academy Prize for Animation of the Year award. 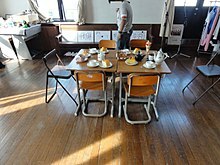 The room at the Toyosato Elementary School that served as the model for the room used by the Light Music Club in the anime. Fans have decorated the room with the items shown in the anime. At the beginning of September 2010, the Kyoto prefectural government began using K-On!! to promote the census and encourage people to be counted. In 2011, Sharp and Bandai announced plans to jointly launch a calculator with designs of the characters from K-On!. K-On! has influenced a string of tourism for the rural town of Toyosato, related to the phenomenon of the anime pilgrimage, home to the elementary school that was used as a model for the high school in the anime. The school has opened portions of itself to the public as an exhibit for the series. Matthew Li of Anime Tourist described the exhibit as, "A place that genuinely understands its fanbase and carries all the sentimental props one can remember from the show and more; housing items seen in the school, like a museum." The anime has also inspired real-life musicians. Hiroto, the bassist of The Sixth Lie, joined a band that was influenced by K-On! when he was in junior high school. ^ "K-ON! Season 1". Sentai Filmworks. Retrieved May 27, 2018. ^ "K-On! Sells More than 15 Billion Yen in Merchandise". Anime News Network. November 3, 2011. Retrieved November 18, 2016. ^ a b c d e f g h "Disband the Club!". K-On!. Season 1. Episode 1. 2009-04-03. ^ a b c d e f g h "Instruments!". K-On!. Season 1. Episode 2. 2009-04-10. ^ a b "Seniors!". K-On!!. Season 2. Episode 1. 2010-04-07. ^ a b c d e "Crisis!". K-On!. Season 1. Episode 11. 2009-06-12. ^ a b c "Christmas!". K-On!. Season 1. Episode 7. 2009-05-15. ^ a b c d e "Another Training Camp!". K-On!. Season 1. Episode 10. 2009-06-05. ^ a b c d e f "Freshman Reception!". K-On!. Season 1. Episode 8. 2010-05-22. ^ a b c d e f "Light Music!". K-On!. Season 1. Episode 12. 2009-06-19. ^ a b "Live House!". K-On!. Season 1. Episode 14 (OVA). 2010-01-20. ^ a b c Kakifly, "Chapter 20", K-On! ^ Kakifly, "Chapter 4", K-On! ^ a b c d e "Advisor!". K-On!. Season 1. Episode 5. 2009-05-01. ^ a b c d "School Festival!". K-On!. Season 1. Episode 6. 2009-05-08. ^ a b c d e Kakifly, "Chapter 7", K-On! ^ a b Kakifly, "Chapter 40", K-On! ^ a b "No Club Room!". K-On!!. Season 2. Episode 17. 2010-07-27. ^ a b c d e f Kakifly, "Chapter 2", K-On! ^ "Upperclassmen!". K-On!!. Season 2. Episode 16. 2010-07-20. ^ a b c d Kakifly, "Chapter 6", K-On! ^ a b "Training Camp!". K-On!. Season 1. Episode 4. 2009-04-24. ^ a b Kakifly, "Chapter 8", K-On! ^ a b Kakifly, "Chapter 29", K-On! ^ a b c "Leading Role!". K-On!!. Season 2. Episode 18. 2010-08-03. ^ a b c d Kakifly, "Chapter 65", K-On! ^ a b Kakifly, "Chapter 57", K-On! ^ a b "Bandai Ent. Adds Gundam 00 Film, Subbed 1st Gundam TV". Anime News Network. October 9, 2010. Retrieved October 9, 2010. ^ a b "Drummer!". K-On!!. Season 2. Episode 3. 2010-04-20. ^ a b c "Upperclassmen!!". K-On!!. Season 2. Episode 16. 2010-07-20. ^ a b c d "Winter Days!". K-On!. Season 1. Episode 13. 2009-06-26. ^ Kakifly, "Chapter 5", K-On! ^ "Planning!". K-On!!. Season 2. Episode 27 (OVA). 2011-03-16. ^ a b c Kakifly, "Chapter 68", K-On! ^ a b Kakifly, "Chapter 17", K-On! ^ a b Kakifly, "Chapter 16", K-On! ^ a b c Kakifly, "Chapter 56", K-On! ^ Kakifly, "Chapter 30", K-On! ^ Kakifly, "Chapter 18", K-On! ^ "Summer Festival!". K-On!!. Season 2. Episode 12. 2009-06-22. ^ a b "Clean-up!". K-On!!. Season 2. Episode 2. 2010-04-13. ^ a b c d "Staying Behind!". K-On!!. Season 2. Episode 5. 2010-05-04. ^ a b c Kakifly, "Chapter 52", K-On! ^ a b c Kakifly, "Chapter 70", K-On! ^ a b Kakifly, "Chapter 13", K-On! ^ a b Kakifly, "Chapter 23", K-On! ^ "Teacher!". K-On!!. Season 2. Episode 10. 2010-06-08. ^ "Cram Session!". K-On!. Season 1. Episode 3. 2010-04-17. ^ a b Kakifly, "Chapter 54", K-On! ^ Kakifly, "Chapter 24", K-On! ^ "Visit!". K-On!!. Season 2. Episode 26. 2010-09-28. ^ Kakifly, "Chapter 15", K-On! ^ Kakifly, "Chapter 39", K-On! ^ Kakifly, "Chapter 51", K-On! ^ Kakifly, "Chapter 58", K-On! ^ Kakifly, "Chapter 62", K-On! ^ Kakifly, "Chapter 60", K-On! ^ Kakifly, "Chapter 61", K-On! ^ a b c Kakifly, "Chapter 55", K-On! ^ a b Kakifly, "Chapter 67", K-On! ^ Kakifly, "Chapter 47", K-On! ^ Kakifly, "Chapter 53", K-On! ^ "Manga Time Kirara May 2007 issue" (in Japanese). Houbunsha. Retrieved February 6, 2009. ^ "K-On! Manga's Last Installment Listed for September". Anime News Network. August 7, 2010. Retrieved August 7, 2010. ^ "Manga Time Kirara Carat October 2008 issue" (in Japanese). Houbunsha. Retrieved February 6, 2009. ^ a b "K-On! Manga Relaunches in Manga Times Kirara This Spring". Anime News Network. February 7, 2011. Retrieved February 7, 2011. ^ a b "K-On! Manga to Cover College, High School in 2 Mags". Anime News Network. March 6, 2011. Retrieved March 7, 2011. ^ "K-ON Manga's Second Run to End in June". Anime News Network. May 7, 2012. Retrieved May 7, 2012. ^ "K-ON Manga's High School Edition to End on June 2". Anime News Network. May 27, 2012. Retrieved May 27, 2012. ^ "Yen Press Adds Haruhi-Chan, K-On! Manga, Bungaku Shoujo". Anime News Network. Retrieved February 3, 2010. ^ "North American Anime, Manga Releases Nov. 28-Dec. 4". Anime News Network. November 30, 2010. Retrieved November 30, 2010. ^ "Yen Press Adds Madoka Magica Spinoff Manga, Last K-ON Volumes". Anime News Network. October 13, 2012. Retrieved October 13, 2012. ^ Ressler, Karen (June 8, 2018). "New K-ON! Manga Launches in July". Anime News Network. Retrieved June 8, 2018. ^ "TBSアニメーション・けいおん!公式ホームページ / 各話紹介" [TBS Animation K-On! Official Homepage / Each Episode Introduction] (in Japanese). TBS. Retrieved July 21, 2009. ^ "K-ON! Extra Episode Green-Lit for 7th BD/DVD Volume". Anime News Network. July 21, 2009. Retrieved July 21, 2009. ^ けいおん! [K-On!] (in Japanese). Disney Channel. Retrieved September 26, 2011. ^ "K-On! on Animax Asia". Animax Asia. March 6, 2010. Retrieved March 6, 2010. ^ "Bandai Entertainment Adds K-On! TV Anime Series". Anime News Network. July 1, 2010. Retrieved July 4, 2010. ^ "Bandai Ent. Adds My-Otome 0~S.ifr~, Sora Kake Girl". Anime News Network. July 31, 2010. Retrieved August 1, 2010. ^ Beveridge, Chris (October 9, 2010). "Bandai Makes Solid New York Anime Festival Announcements". Mania. Archived from the original on October 11, 2010. Retrieved October 9, 2010. ^ "K-ON! Volume 1 (Blu-ray) (Pre-order! Available 04/26/2011)". January 2011. Archived from the original on January 30, 2011. Retrieved January 29, 2011. ^ "K-ON! Anime Legends DVD Box Solicited". Anime News Network. January 6, 2012. Retrieved January 8, 2012. ^ "Manga UK Adds Haruhi Film, 2nd TV Season, Haruhi-chan". Anime News Network. October 31, 2010. Retrieved October 31, 2010. ^ "K-ON release plans in UK". Anime News Network. April 1, 2011. Retrieved April 1, 2011. ^ "Blu-ray Editions of K-ON! and The Disappearance of Haruhi Suzumiya Cancelled". Anime News Network. January 6, 2012. Retrieved January 8, 2012. ^ "Sentai Filmworks Adds K-On! Season 1". Anime News Network. May 20, 2014. Retrieved May 20, 2014. ^ "Hamatora Anime Gets English Dub". Anime News Network. May 19, 2015. Retrieved May 20, 2015. ^ "K-On! Anime's 2nd Season Officially Announced". Anime News Network. December 30, 2009. Retrieved December 30, 2009. ^ "TBSアニメーション・けいおん! !公式ホームページ / 最新情報" [TBS Animation K-On! Official Homepage / News]. March 17, 2010. Retrieved March 17, 2010. ^ "K-On's 2nd Season, B Gata H Kei Anime Dated for April". Anime News Network. January 29, 2010. Retrieved March 17, 2010. ^ "K-ON!! Gets New Side-Story Episode Green-Lit". Anime News Network. March 15, 2010. Retrieved October 18, 2010. ^ "K-On!! on Animax Asia". Animax Asia. October 9, 2010. Archived from the original on October 11, 2010. Retrieved October 9, 2010. ^ "Sentai Filmworks Licenses K-ON! Season 2". Anime News Network. February 20, 2012. Retrieved February 20, 2012. ^ "K-On! Film's Basic Story Premise Revealed". Anime News Network. August 13, 2011. Retrieved August 13, 2011. ^ "TBSアニメーション・けいおん!!公式ホームページ". TBS. February 20, 2011. Retrieved February 20, 2011. ^ "K-On! Gets Film Green-Lit". Anime News Network. September 28, 2010. Retrieved February 20, 2011. ^ "K-On! Film Scheduled for December 3". Anime News Network. February 20, 2011. Retrieved February 20, 2011. ^ "Japan Box Office, December 3–4, 2011". Box Office Mojo. IMDb.com, Inc. Retrieved 20 August 2014. ^ "Japan Box Office, February 4–5, 2012". Box Office Mojo. IMDb.com, Inc. Retrieved 20 August 2014. ^ "Japanese K-ON! Fans Present Film Graphic to London Café". Anime News Network. February 16, 2012. Retrieved February 22, 2012. ^ "Sentai Filmworks Licenses K-On! Film". Anime News Network. Retrieved 23 January 2013. ^ "K-On! The Movie". Madman Entertainment. Retrieved December 10, 2016. ^ "K-On! anime news from June 2009" (in Japanese). TBS. Retrieved June 22, 2009. ^ ｢けいおん! !｣新主題歌が8/4に発売決定 [It Is Determined That the New Theme Songs of K-On!! Will Be Released on August 4]. Oricon Style (in Japanese). Oricon. July 8, 2010. Retrieved July 9, 2010. ^ 第20話｢けいおん! !｣ごはんはおかず ["Gohan wa Okazu" Revealed in K-On!! Episode 20] (in Japanese). HMV Group. August 18, 2010. Retrieved August 19, 2010. ^ "Composer Bice Wrote K-On!! Song Before Passing Away". Anime News Network. August 18, 2010. Retrieved August 18, 2010. ^ "K-On!! Album to Ship on Audio Cassette Tape". Anime News Network. September 14, 2010. Retrieved September 14, 2010. ^ ｢けいおん! 放課後ライブ!!｣9月30日に発売! 予約特典はきせかえステッカー [K-On! Hōkago Live!! Will Be Released on September 30! The Pre-Order Special Feature Is the Dress-up Stickers] (in Japanese). Dengeki Online. June 25, 2010. Retrieved June 26, 2010. ^ "桜高軽音部、PSPのステージへ! ｢けいおん! 放課後ライブ! !｣" [Sakurakō Light Music Club, to the PSP Stage! K-On! Hōkago Live!!] (in Japanese). Famitsu. June 3, 2010. Retrieved June 3, 2010. ^ "K-ON! Ho-kago Live!! PSP Rhythm Game to Be Ported to PS3". Anime News Network. March 6, 2012. Retrieved March 7, 2012. ^ "『けいおん! 放課後ライブ!! HD Ver.』の発売日が2012年6月21日に決定" [K-On! Hōkago Live!! HD Ver. 's Sale Date Determined to be June 21, 2012] (in Japanese). Famitsu. March 23, 2012. Retrieved March 23, 2012. ^ "K-ON! Arcade Rhythm/Card Game to Launch This Spring". Anime News Network. April 2, 2013. Retrieved April 2, 2013. ^ "Five Years On, K-On Is Back With A New Music Game". Siliconera. September 14, 2014. Retrieved September 16, 2014. ^ "アーケード版リズムゲームに登場！！『けいおん！！放課後リズムセレクション』9月13日（土）、14日（日）、15日（月・祝）の3日間 ロケテスト開催のお知らせ". Sega. September 5, 2014. Archived from the original on October 28, 2014. Retrieved November 6, 2017. ^ "Exploring the Anime World of K-On! in Toyosato". Biwako Visitors Bureau. July 2, 2011. Retrieved January 10, 2012. ^ "Anime PilgrFile: Visiting the model of K-ON!! Highschool". Gigazine. July 28, 2010. Retrieved January 3, 2012. ^ "Japanese Comic Ranking, April 27-May 3". Anime News Network. May 6, 2009. Retrieved May 14, 2009. ^ "Japanese Comic Ranking, May 4–10". Anime News Network. May 13, 2009. Retrieved May 14, 2009. ^ "Japanese Comic Ranking, December 14–20". Anime News Network. December 23, 2009. Retrieved June 29, 2010. ^ "Top-Selling Manga in Japan by Volume: 1st Half of 2010". Anime News Network. June 2, 2010. Retrieved June 29, 2010. ^ "K-On! : Haruhi's Reincarnation? The Ending and Opening Themes Ranked 2 and 4 on Oricon" (in Japanese). Mainichi Shimbun. April 28, 2008. Archived from the original on May 14, 2009. Retrieved May 15, 2009. ^ "WALL-E, Eden of the East, Haruhi-chan Win Anime Kobe Awards". Anime News Network. September 4, 2009. Retrieved September 7, 2009. ^ レコード協会調べ 7月度有料音楽配信認定 [Recording Association Examination July Free Online Music Distribution Certifications] (in Japanese). Recording Industry Association of Japan. Retrieved August 19, 2011. ^ レコード協会調べ 5月度有料音楽配信認定 [Recording Association Examination May Free Online Music Distribution Certifications] (in Japanese). Recording Industry Association of Japan. Retrieved June 21, 2010. ^ "K-ON! Album is 1st Anime Character CDs to Top Weekly Chart". Anime News Network. July 28, 2009. Retrieved October 18, 2009. ^ 2010年05月第2週のシングルランキング情報 [Oricon Single Rankings for the Second Week of May 2010] (in Japanese). Oricon. Retrieved May 5, 2010. ^ ｢けいおん!｣が史上初アニメキャラ首位、聖子以来26年ぶり1、2位独占も記録 [K-On! Produces the First Anime Characters to Top the Charts. They are also the First Female Act to Occupy Top Two Spots in 26 Years since Seiko] (in Japanese). Oricon. May 4, 2010. Retrieved May 5, 2010. ^ "K-On!! Puts 1st Anime Band at #1 on Weekly Singles Chart". Anime News Network. May 3, 2010. Retrieved May 5, 2010. ^ "New K-On!! Songs Are #2, #3 on Weekly Singles Chart". Anime News Network. August 9, 2010. Retrieved August 10, 2010. ^ ゴールド等認定作品一覧 2010年08月 [Gold etc. Certified Works at a Glance August 2010] (in Japanese). Recording Industry Association of Japan. Retrieved September 11, 2010. ^ "K-On's "Gohan wa Okazu"/"U&I" Single is #3 on Weekly Chart". Anime News Network. September 13, 2010. Retrieved September 13, 2010. ^ "K-ON's Ho-kago Tea Time II Tops Album Chart With 127,000". Anime News Network. November 1, 2010. Retrieved November 2, 2010. ^ a b "1st K-On! Volume is Now #2 Blu-Ray in Japan So Far". Anime News Network. August 4, 2009. Retrieved August 4, 2009. ^ "Japanese Animation Blu-ray Disc Ranking, October 5–11". Anime News Network. October 15, 2009. Retrieved October 18, 2009. ^ "K-ON! Tops Bakemonogatari as #1 TV Anime in BD Sales". Anime News Network. September 21, 2010. Retrieved September 22, 2010. ^ "Summer Wars Wins Tokyo Anime Fair's Top Award, 6 More". Anime News Network. February 16, 2010. Retrieved February 16, 2010. ^ "Haruhi Film, K-ON! !, Miku Win Anime Kobe Awards". Anime News Network. October 15, 2010. Retrieved October 18, 2010. ^ "K-ON! is 1st TV Anime Franchise to Sell 500,000+ BDs". Anime News Network. February 22, 2011. Retrieved February 22, 2011. ^ "Japan Academy Prize Nods Confirmed for K-ON, Poppy Hill, Others". Anime News Network. January 16, 2012. Retrieved January 16, 2012. ^ 平成22年国勢調査のお知らせ [Explanation of the Heisei 22 National Census] (in Japanese). Kyoto, Japan: Kyoto Prefecture. Archived from the original on September 8, 2010. Retrieved September 8, 2010. ^ "Sharp, Bandai to launch calculators with anime, cartoon characters". Mainichi Daily News. February 18, 2011. Retrieved February 20, 2011. ^ "The Longevity of Anime Pilgrimages". Anime Tourist. Archived from the original on November 7, 2017. Retrieved April 12, 2019. ^ "The Sixth Lie". Animethon. Retrieved May 3, 2017. Creamer, Nick (December 2, 2015). "What Makes Kyoto Animation So Special?". Anime News Network. Retrieved December 2, 2015. An analysis of Kyoto Animation's work through the lens of K-On!. Wikimedia Commons has media related to K-On!.